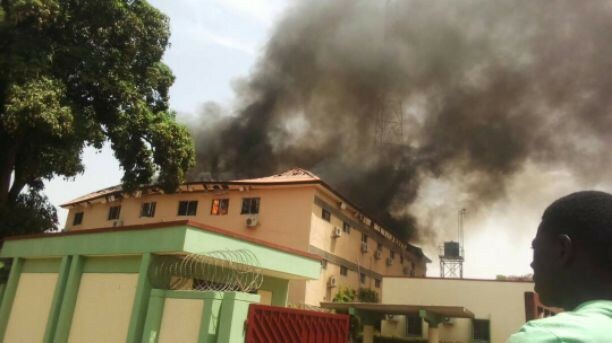 The Kaduna State Independent Electoral Commission (KADSIECOM)’s head office located on Sokoto road, about five minutes drive from Kaduna State government house is on fire. The remote or immediate cause of thefire is unknown as the press time. This unfirtunate incident is coming less than a month to the state’s local government election scheduled to hold May 12, 2018. Eyeswitnesses accounts revealed that, the fire started around 10am but took fire fighters hours to arrived the scene despite its proximity to the service area leading to good destruction of part of the building and other valuable that couldn’t be quantified now. Men of joint security operatives were seen on ground controlling the crowd that converged at the structure located on Sokoto Road in Kaduna metropolis. A source within hinted that, some top shots of KADSIECOM were having meeting when the fire started and eventually distrusted the meeting. Officials said the details would be communicated to the newsmen much later.